HMH Books for Young Readers, 9780544088931, 160pp. Anyone who has ever spent time with a dog knows that dogs love sniffing! They sniff out hidden food, dirty socks, and the visitor who comes to the door. But some dogs work with police officers, soldiers and even scientists to put their "sniffers" to work. Sniffer dogs make use of the amazing biology behind their noses to protect people from bombs, catch criminals smuggling drugs, or help researchers locate a hard to find snail in a forest. A dog's nose is so sensitive that if a human could see as well as a dog could smell, we would be able to see the small letters on an eye chart from four (four!) miles away. Is it any wonder then that dogs can be trained to find missing people in piles of rubble or a certain flower blooming amongst hundreds or thousands of other smells? * "An exemplary presentation of information in a lively, engaging way—readers will be left feeling awe for their canine companions and enthusiasm for their abilities." "Superb coverage of the canine contribution to rescue and safety in both text and illustration." 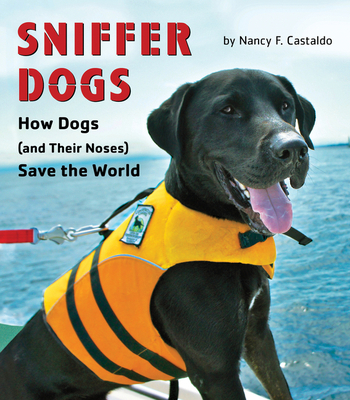 "A well-organized, thoughtfully written title that celebrates the achievements of these great dogs." "This fascinating account will leave young readers feeling wonder and gratitude for the gifts of the canine set." "The adventurous element of search and rescue and military duty adds an edge to draw readers unenticed by (or unwilling to be caught with) mere cute puppies."